OMG! 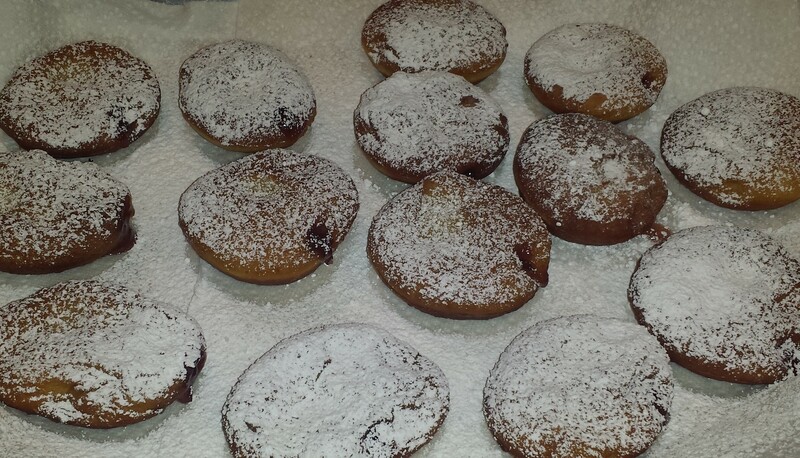 I see why sufganiyot is all the rage in Israel during Hanukkah! 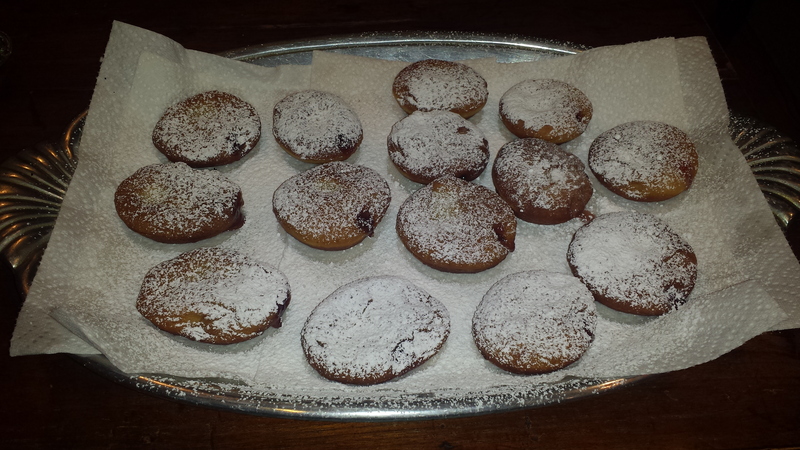 Fried dough still warm from the pan, filled with yummy jam and sprinkled with powdered sugar, is pretty hard to beat. 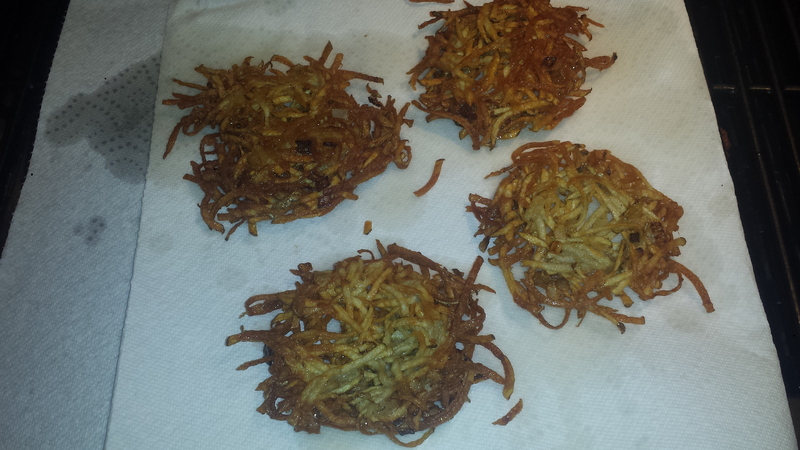 I tend to stay away from fried foods, however, on Hanukkah when it’s traditional to eat foods fried in oil, I make an exception. 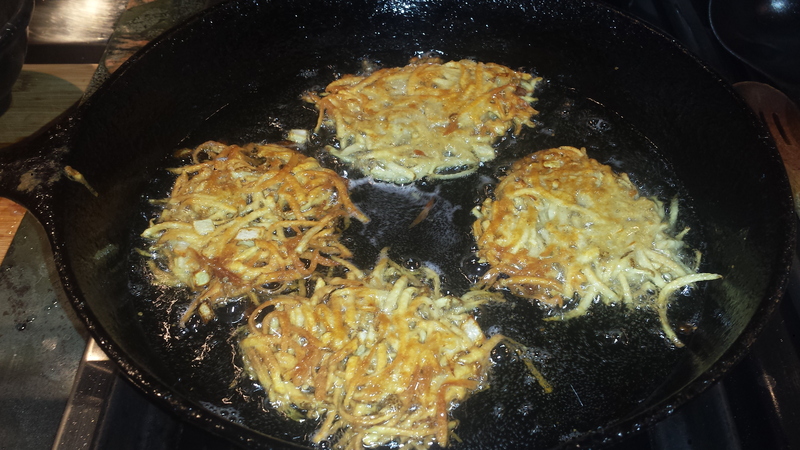 I recently posted a recipe for yummy Potato Latkes, which are a classic Hanukkah treat, in case you prefer savory over sweet. 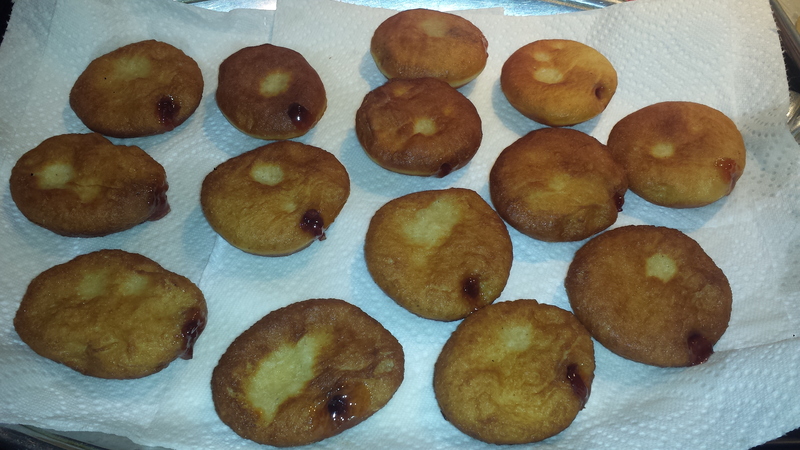 I made sufganiyot quite a few years ago, following a recipe I got from Temple Emanu-El when Eric and I were taking a Mommy and Me Tot Shabbat class. 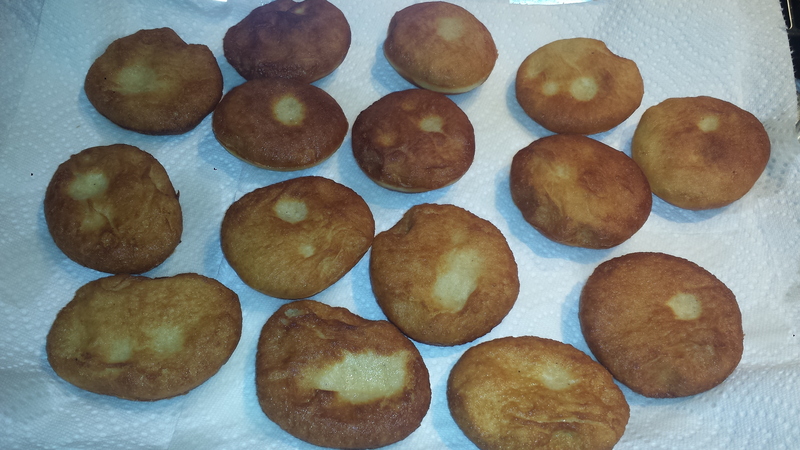 We had a lot of fun making doughnuts and I remember it being a fun kid activity (the jelly and powdered sugar part anyway). That was quite a while ago, since Eric is now turning 26! I know the recipe is around here somewhere and I will probably find it when I’m no longer looking for it, such is the way of misplaced objects which seem to turn up right in front of your nose. I’m fully expecting to stumble upon this recipe within the next couple of days. 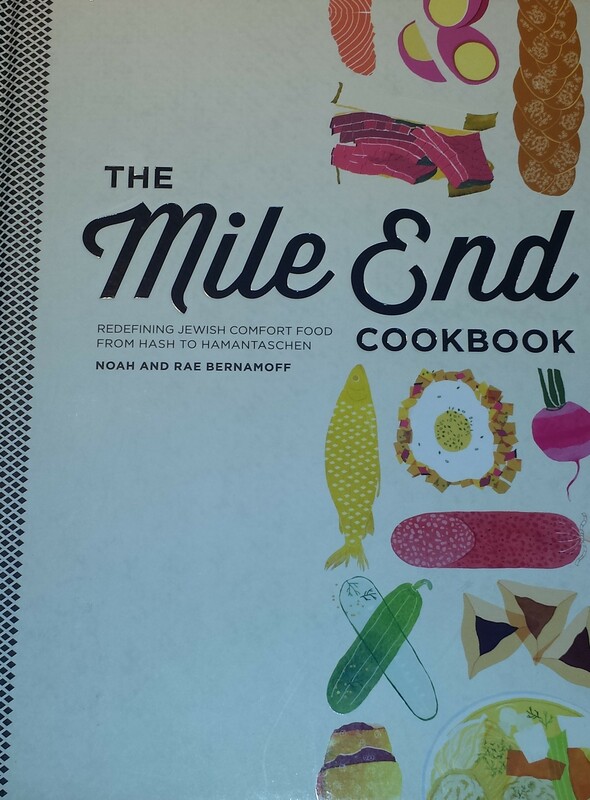 Since I couldn’t find my recipe, I turned to “The Mile End Cookbook – Redefining Jewish Comfort Food from Hash to Hamantaschen” given to me by my friend, Karin, for my birthday. It’s a great cookbook filled with recipes for all kinds of dishes I have heard of (mostly from my Mother in Law) but never knew what they were, like Kasha Varnishkes and Kreplach. By the way, for those left wondering, they are a noodle/grain dish and meat dumplings, respectively. 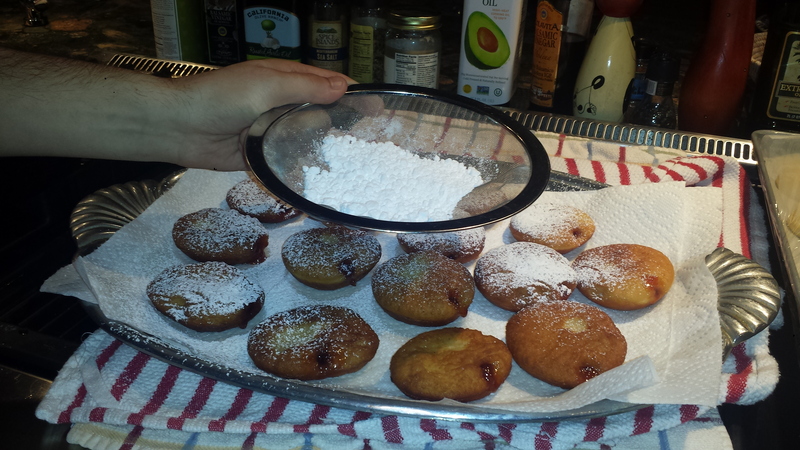 “The Mile End Cookbook” offers an easy recipe for Jelly Doughnuts, called Sufganiyot in Hebrew. These doughnuts are light and delicious but not too sweet, although that is partly determined by the type and quantity of the jelly that is used. 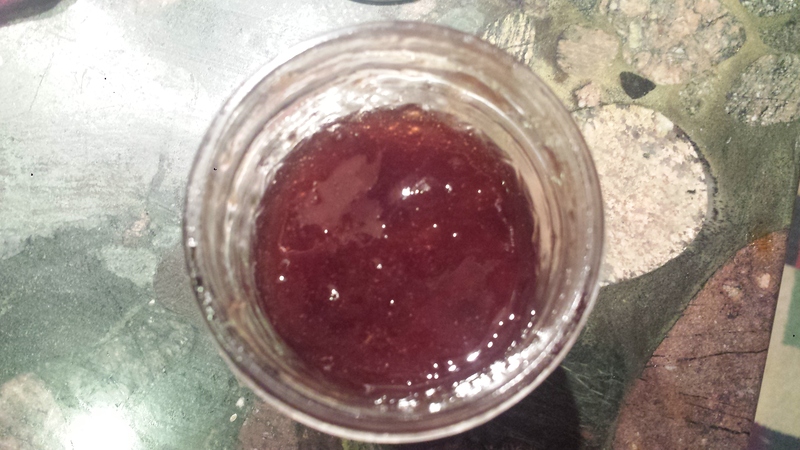 I used a Santa Rosa Plum jam that I made last year from plums from my garden, which is a blend of sweet and tart that offsets the sugar nicely. A strawberry or grape jelly will yield a sweeter result. TIPS: I used a bread maker set on the dough setting to make the dough but I have provided directions for both ways below. This recipe makes 2 dozen or more doughnuts. I made half and refrigerated the other half but it never rose quite well enough. 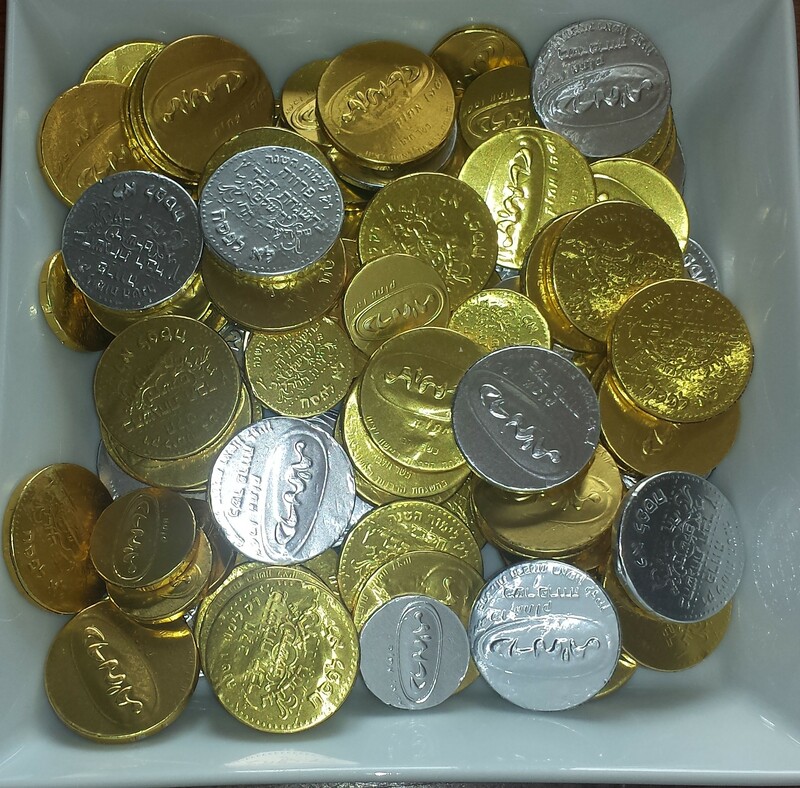 I am not an expert baker though, so perhaps there are tips on saving dough that I don’t know. 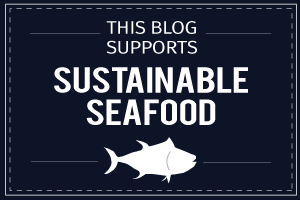 Unless you are making for a large crowd, I would recommend halving the recipe. 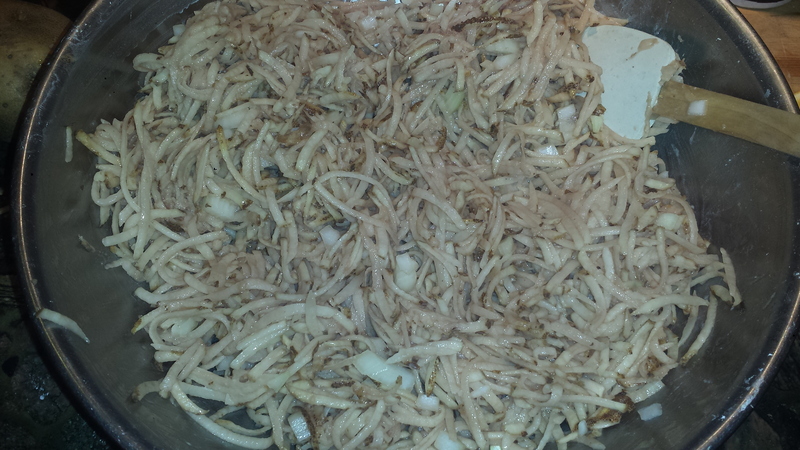 Add the first 6 ingredients to a large bowl and stir to combine. Add the flour and salt and stir (or mix with your hands) until the dough comes together (it will still be wet and sticky). 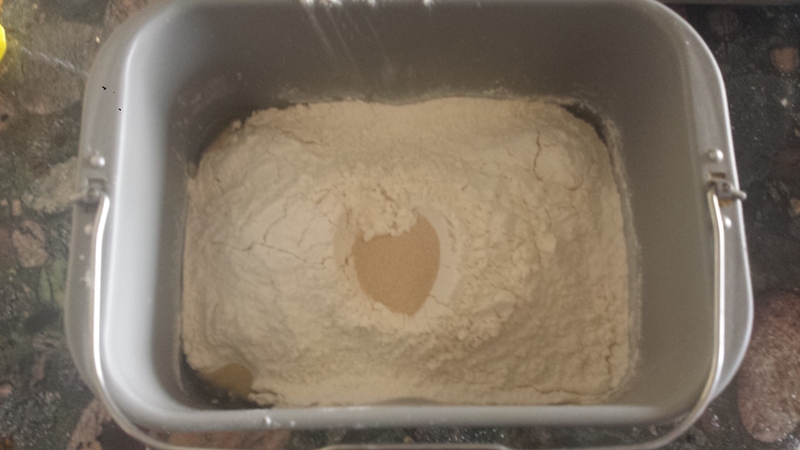 On a well-floured surface, knead and shape the dough into a thick disk, transfer it to a bowl that’s greased with oil and let it rest in a warm, draft free area for 1 hour. 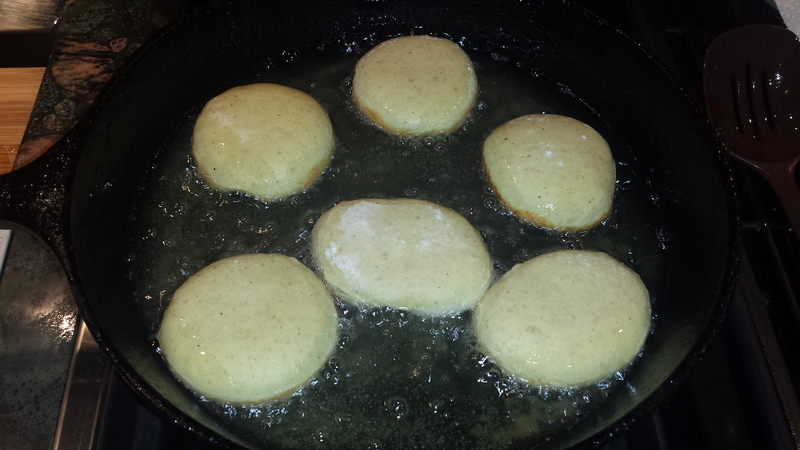 Add the water(warmer than lukewarm but not hot), butter and eggs to the bread maker. 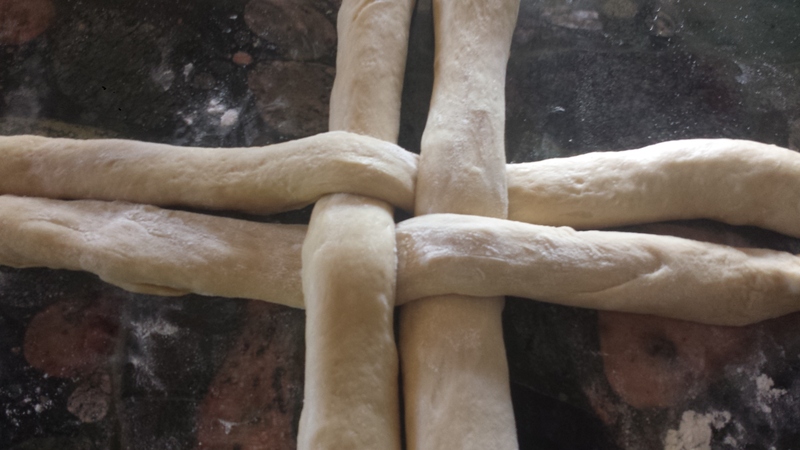 Then add salt, flour, sugar and yeast in that order. Turn the bread maker to dough setting (which is usually about 20 minutes or so). Let dough rise another half hour but watch to make sure it doesn’t hit the lid. 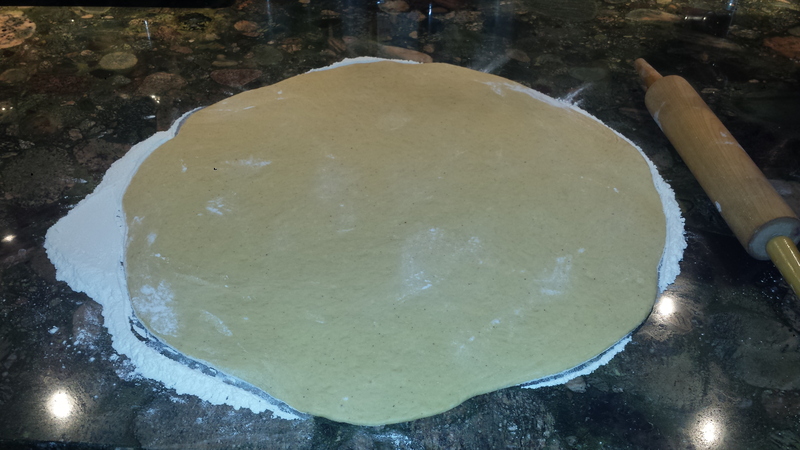 On a well-floured surface, flatten the dough and roll it out into a 1/4 inch thick disk (Like a really thick pizza dough). 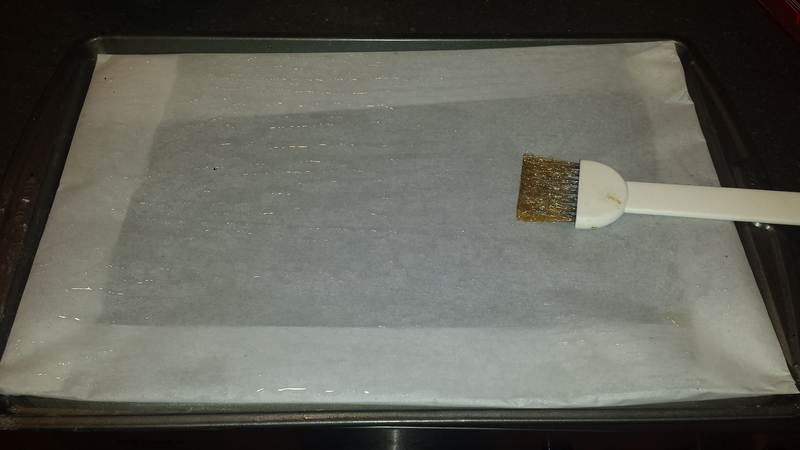 Line a cookie sheet with parchment paper and brush with oil. 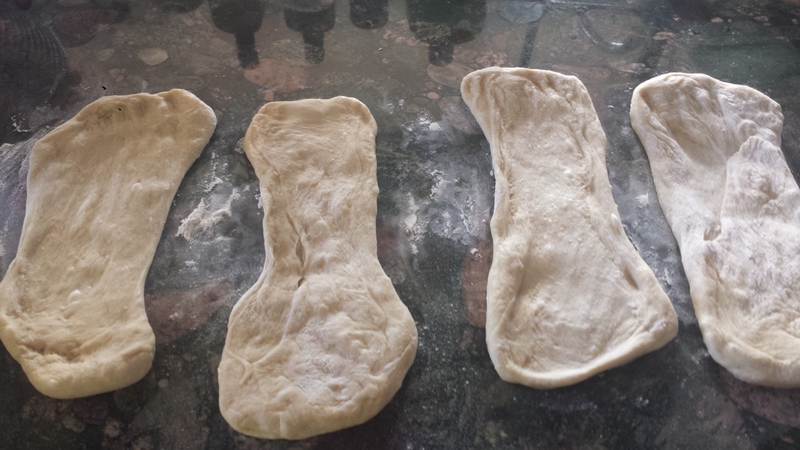 Using a 2 inch round cookie cutter or juice glass, cut out as many circles of dough as you can. 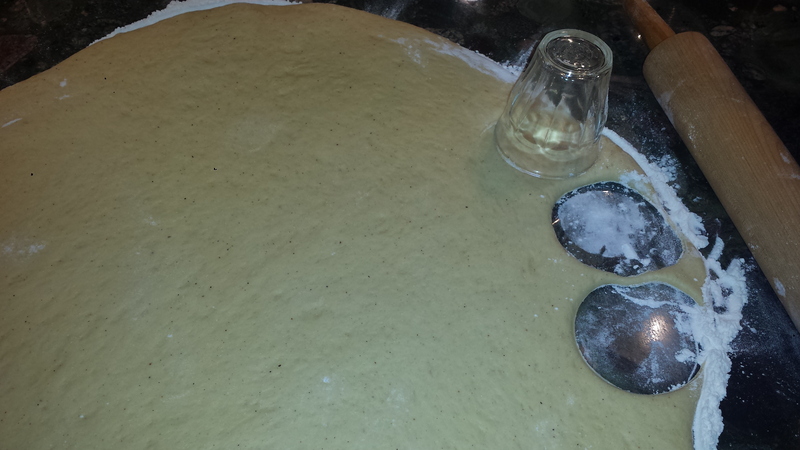 Transfer circles to cookie sheet, leaving room for expansion. Collect the dough trimmings and form them into another ball, roll it out again and cut more circles. Repeat until dough is used. 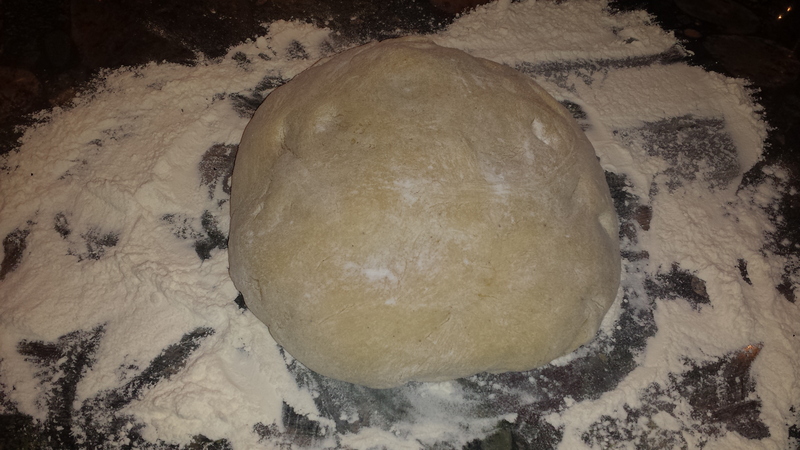 Let the dough circles rest in a warm, draft free area for 1/2 hour. Heat about 1 inch of oil in a high sided skillet over medium high heat until very hot but not smoking (365 to 375 degrees). 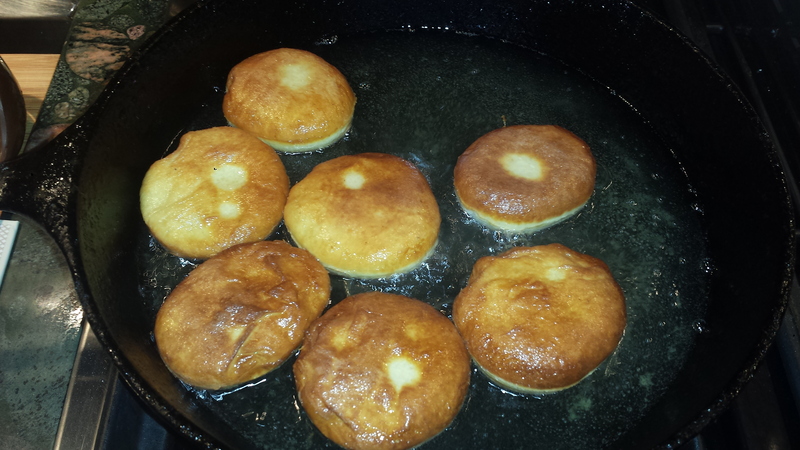 Working in batches, fry the doughnuts until they’re golden brown on one side. Transfer to papertowels to drain. Put jelly in a pastry or Ziploc bag with a small hole cut from one corner. 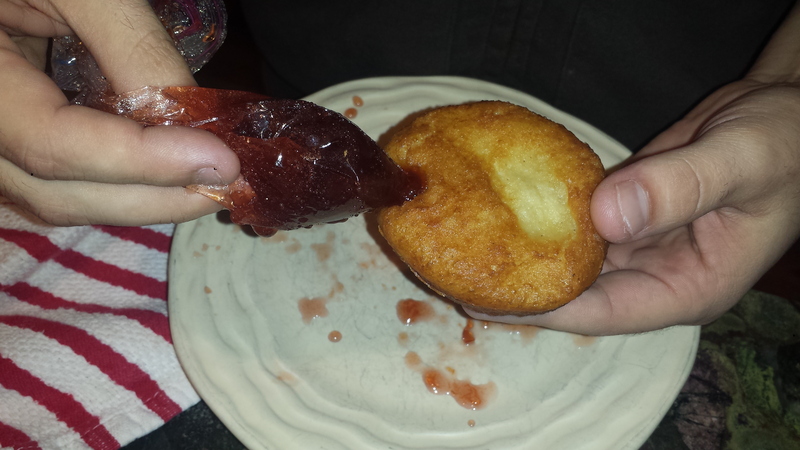 When cool enough to handle, insert a small knife (I used a chopstick) into the side of each doughnut and more it around to make room in the center for jelly. Insert the tip of the bag in the opening and pipe in as much jelly as possible. 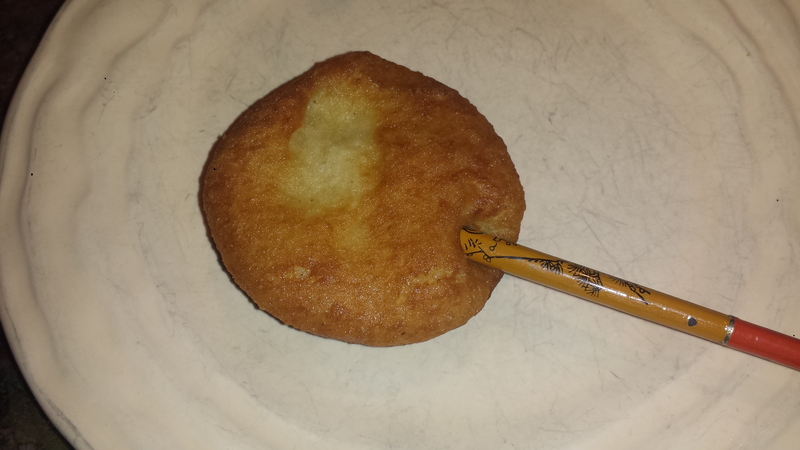 If you have a cake decorating tip you can insert that in the hole before adding the jelly to the bag for easier piping. Repeat with the remaining doughnuts. Dust the doughnuts generously with powdered sugar and a pinch of coarse salt. Happy 5775! 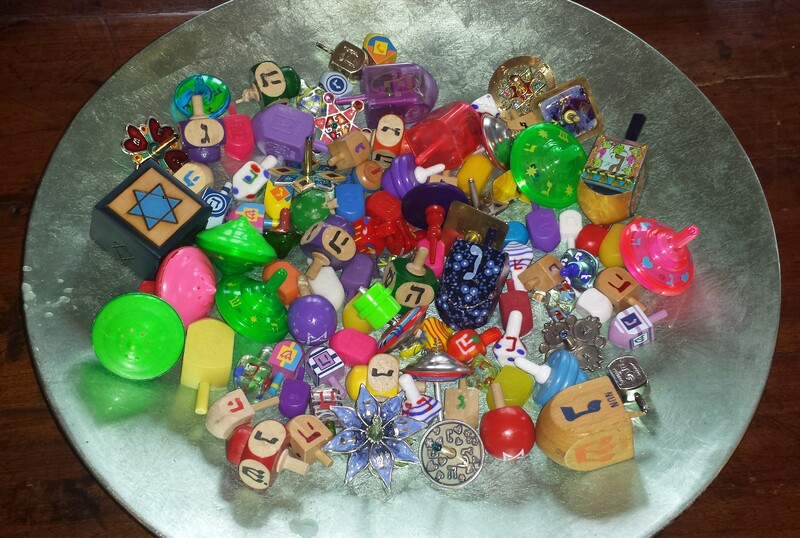 Rosh Hashanah, the Jewish New Year, is next week! What is Rosh Hashanah? Rosh Hashanah, literally“Head of the Year“, is observed on the first day of the Jewish year which is based on the Hebrew Calendar rather than the Gregorian or Western Calendar (which is the calendar we use every day). Unlike the Western New Year which is a big celebration, Rosh Hashanah is more a time for reflection and introspection, forgiveness and hope. 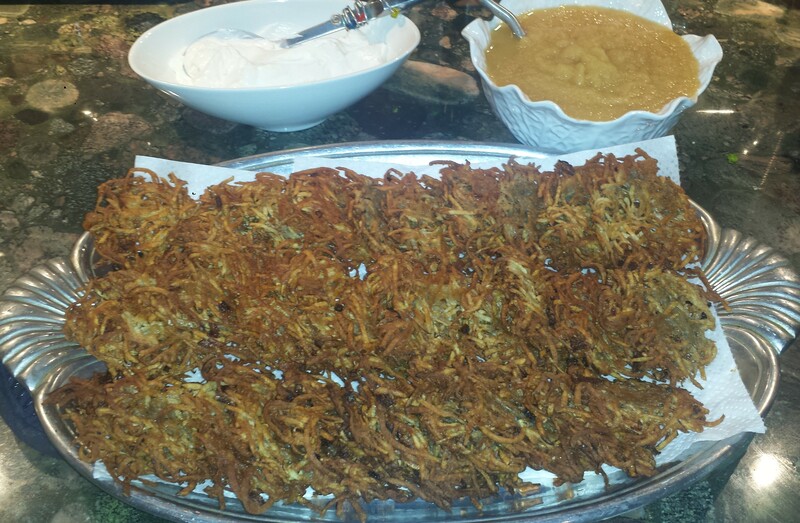 As is true with all Jewish holidays, there is a great emphasis on food. 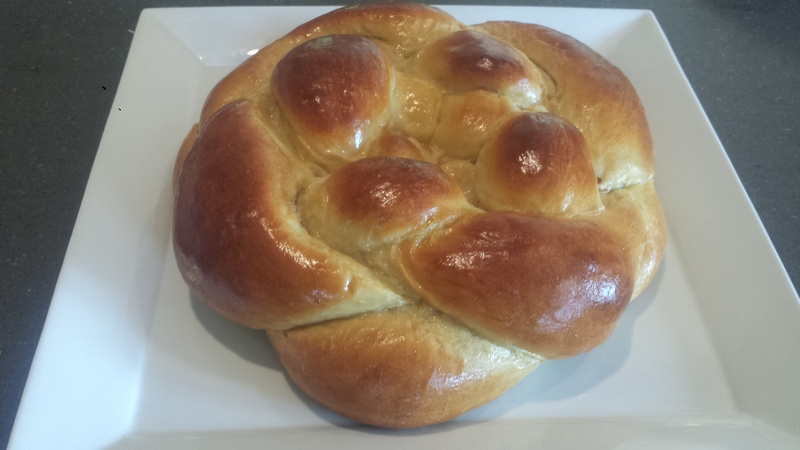 During Rosh Hashanah, a round challah is usually served, symbolizing the circle of life and the cyclical nature of the year – the completion of the old year and the beginning of the new year. 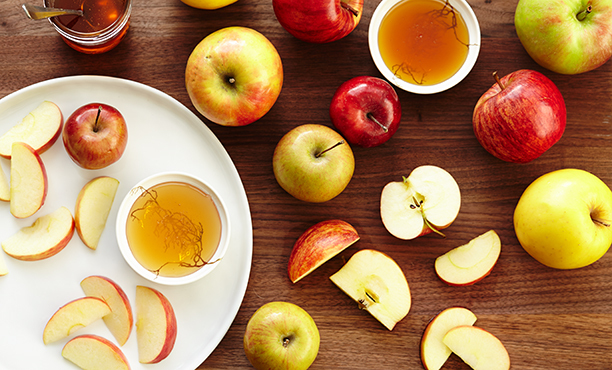 Apples dipped in honey are also traditionally eaten on Rosh Hashana, symbolizing wishes for a sweet new year. First you dip the challah in the honey and then the apple. It’s a delicious little slice of heaven! I also love the challah slathered in butter AND dripping with honey. Delish! 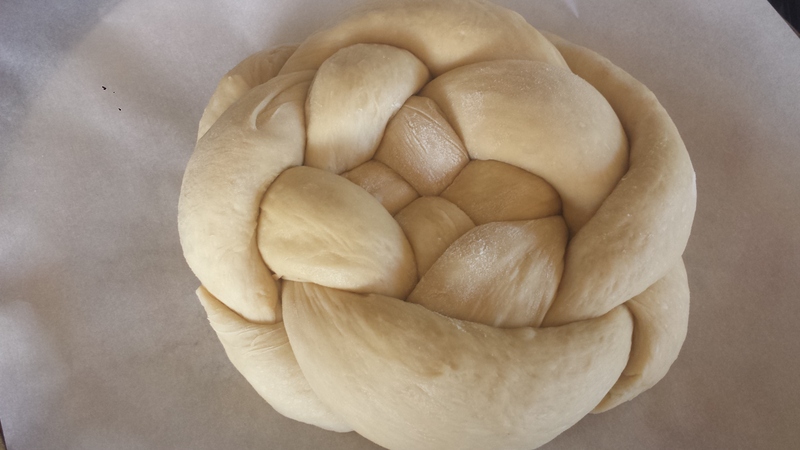 I have been making a braided challah for many years and have only tried making a round challah with apples and honey once, with less than stellar success. The apples were too wet and the dough turned into a sticky mess. 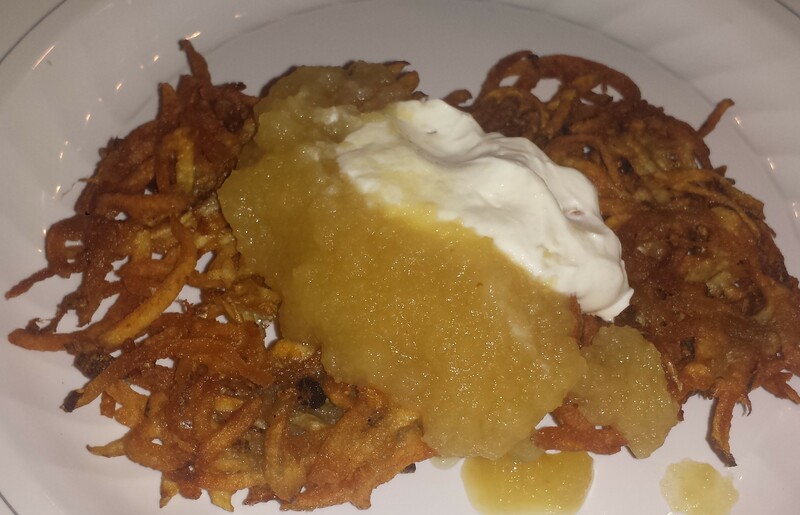 Undaunted, I decided to try again, because who can resist putting all three yummy Rosh Hashanah foods together into one delicious dish? 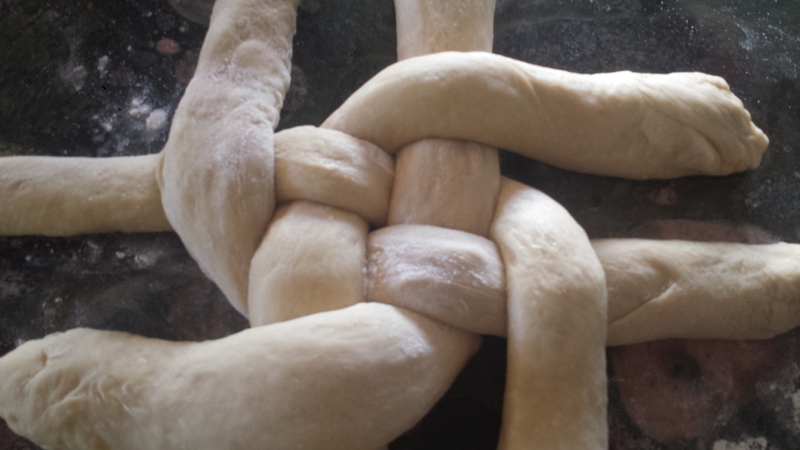 I decided to attempt the braiding instructions by food personality and blogger Tori Avey who not only provides numbered braiding instructions but step by step instructions for making dough from scratch. 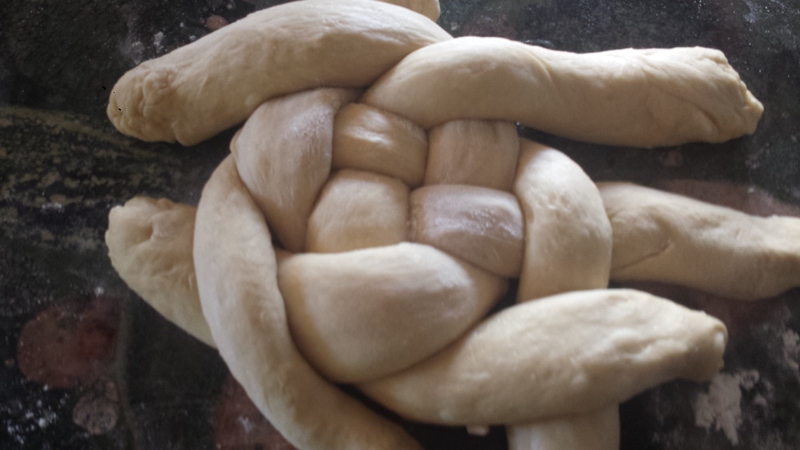 I opted to use my handy bread machine to make the dough and then followed the braiding instructions. I adapted my recipe for a bread maker, so check out Tori Avey for info on making the dough by hand. 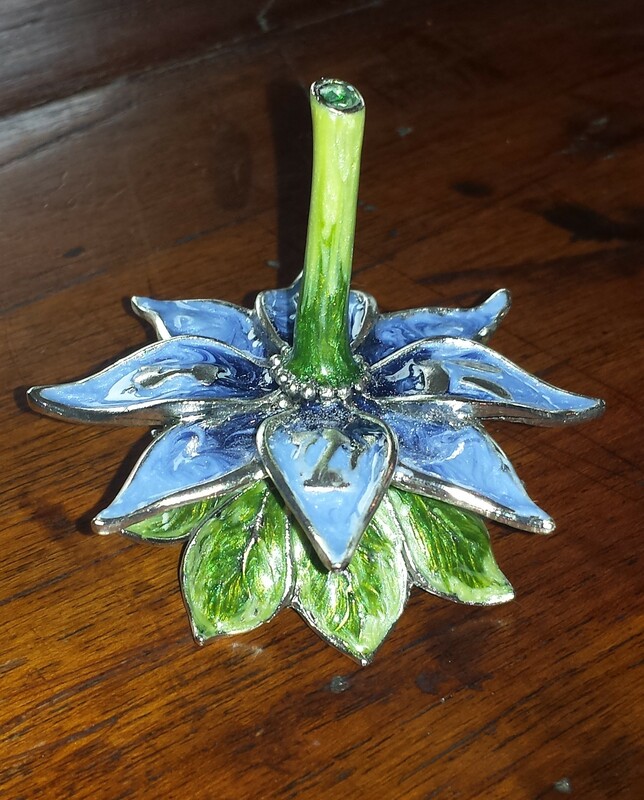 The result was quite wonderful! The apples and cinnamon add a touch of yummy sweetness inside. 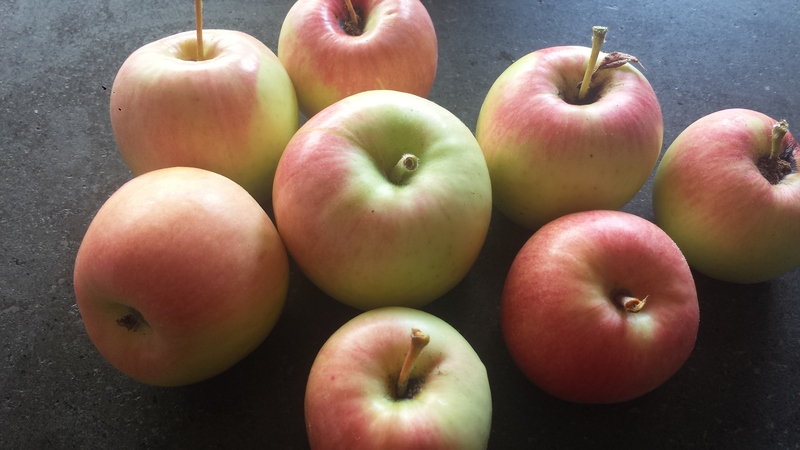 I used Pink Lady Apples from my garden but you can use pretty much any variety you like. Granny Smith and Pippin are particularly good for cooking. 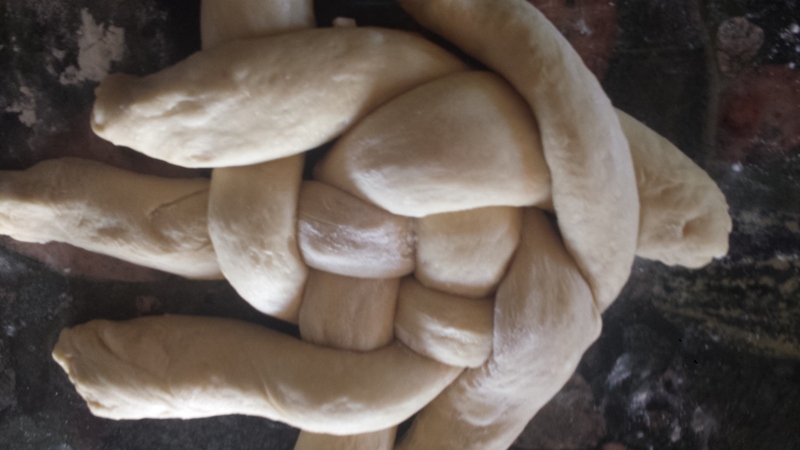 The braiding looks intimidating but is actually quite easy. 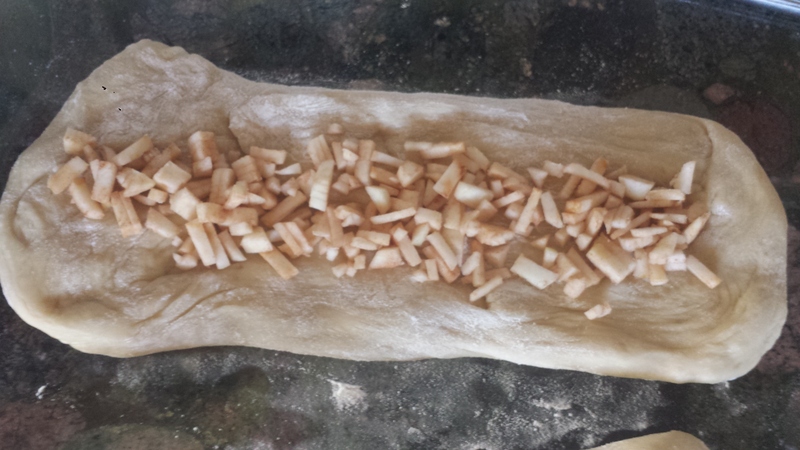 TIP: I was concerned that the apples would cause the braiding to fall apart – again, so I separated my dough into four sections and flattened them into long rectangles. Then I filled one section at a time (to avoid the lemon water bath which prevents the apples from browning but also leaves the apples wet and hard to dry). I cut about a half an apple into small pieces and spread them onto the dough rectangle, sprinkled with cinnamon and sugar and pinched it closed to form a ‘rope’. Then I repeated with the other three. 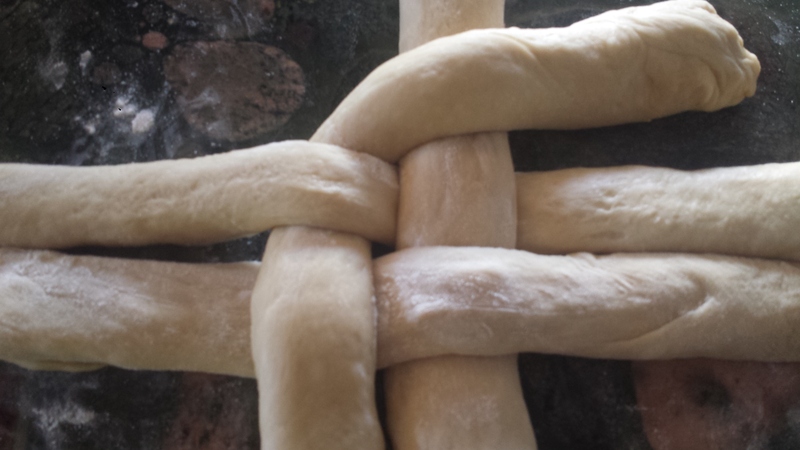 The braiding process is not that complicated once you get started. I loved Tori’s numbered strands but got lost going into the third round so figured out an easy method to follow. 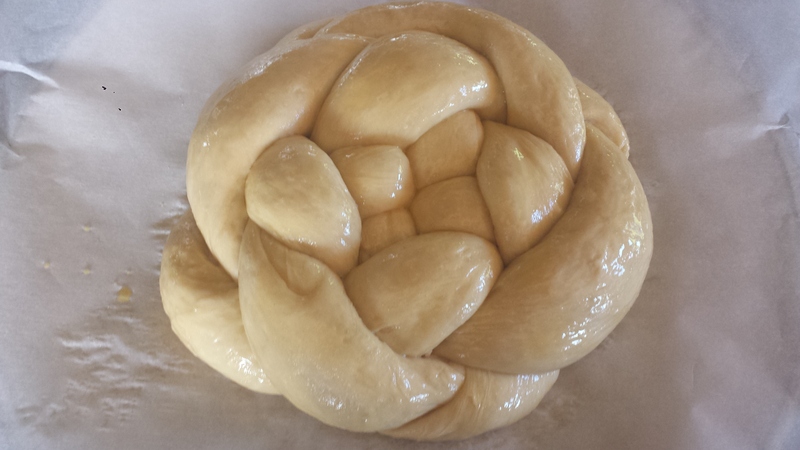 I made one large challah but you can also make two smaller loaves by dividing the dough into 8 pieces. Put all ingredients in bread machine in the order listed. It’s very important that all ingredients are at room temperature (except the water) or the yeast will not activate. Set the bread machine to the dough cycle which should take about an hour and a half. I usually let it sit another half hour. 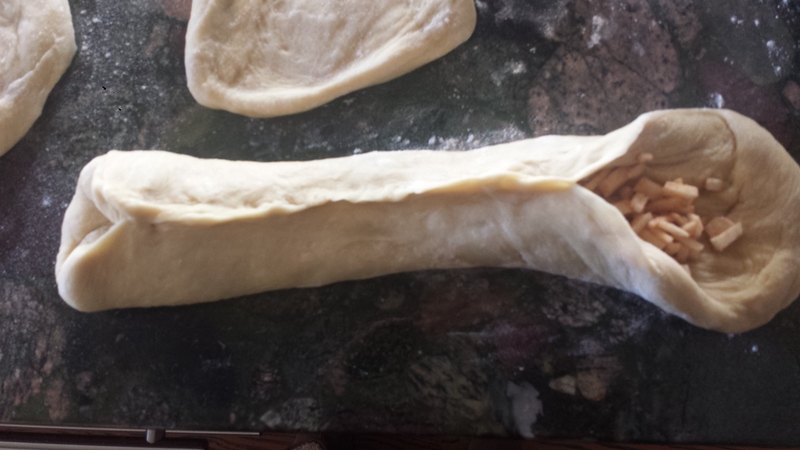 If you don’t have a bread machine, click on Tori Avey for great instructions on making handmade dough. 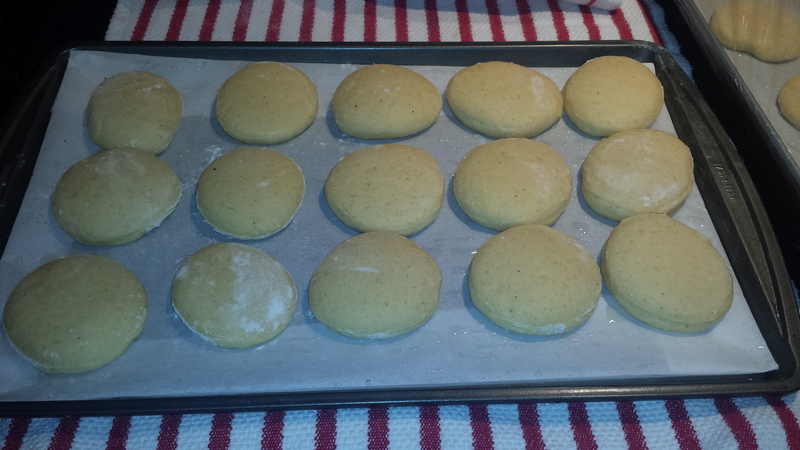 Lightly flour your work surface to prevent sticking. Remove dough from bread machine and cut into four equal pieces if making one large challah or eight pieces if making two. 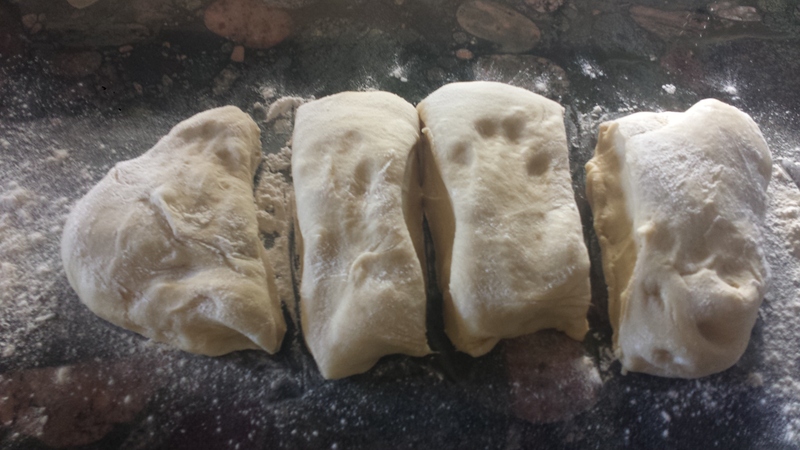 If you are making two, keep half the dough in a bowl covered with a towel while you prepare the first one. Flatten the four pieces into rectangular pieces, making sure they don’t get too thin or the apples will fall out. 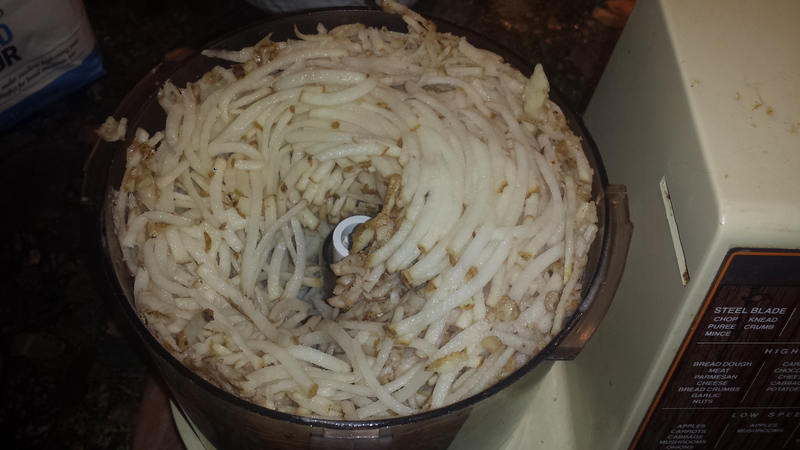 Pinch the rectangle closed, enclosing the apples, and make into a rope. You might have to stretch it a bit. Make sure the ends are closed. Repeat with other three rectangles. Cross the top left strand over the one to it’s right. 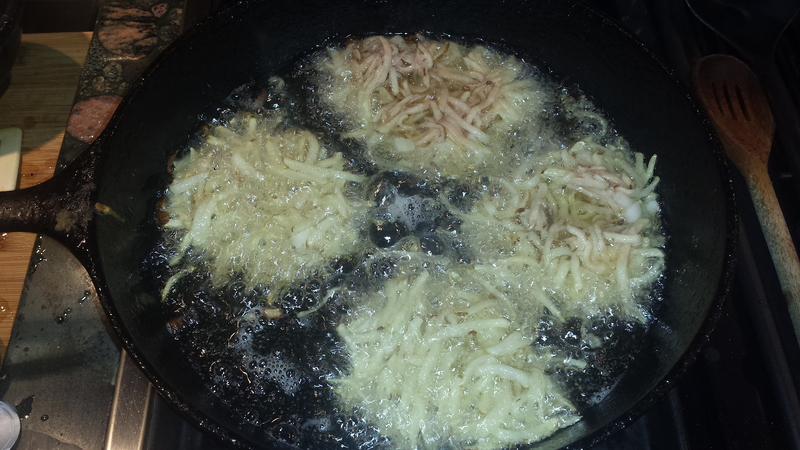 Going clockwise, repeat with the three other sides. It’s less complicated than it looks. Now going counterclockwise, cross the remaining straight pieces over the strands you just crossed. Keep going around the circle, stretching a bit if necessary, until you’re left with short ends. Tuck the shorts ends under and secure them with a pinch (underneath). Cover with a clean, dry towel and let raise 20 minutes or so. 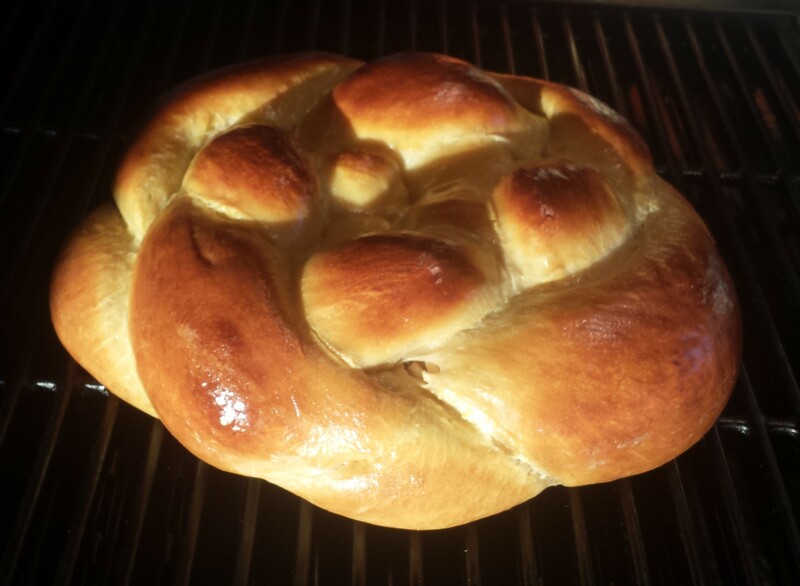 Place challah on a baking sheet covered with parchment paper. Beat the remaining egg and add a dash of salt. 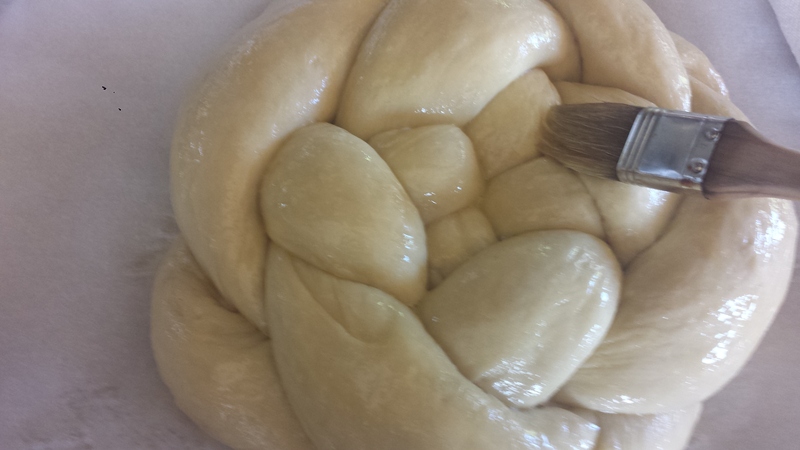 Brush the eggwash over the braided challah. You can top with sesame or poppy seeds, or even add honey to your wash. Reserve eggwash. 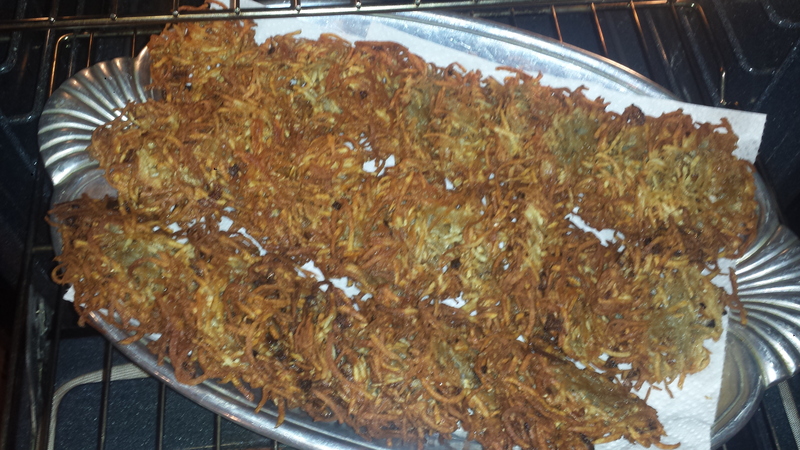 Bake for 45 minutes to an hour at 350 degrees. My oven is hot so I bake at 325. After 20 minutes remove from the oven and brush with a light layer of the eggwash, especially in the grooves where the dough expands (and sometimes cracks). Remove from the oven and let cool on wire racks. You can test the bread for doneness by turning it over and tapping on the bottom of the loaf—if it makes a hollow sound, and it’s golden brown all the way across, it’s done. Because of the apples in this challah, it may take a bit longer to bake than your regular challah recipe. Its better to overcook than undercook. If it’s brown but not yet fully cooked, tent with aluminum foil to prevent overbrowning. To serve, slice or pull apart.